As you all no doubt recall, it was hinted recently here, and was a result of this, with the first discovery of it here: is that Red-9 had Dimitri’s child. I hope you all enjoyed the bonus story. It was a bit more plot detailed than the main story, so it might depend more on reading it all in one go. If you wish to, it began here. The three unfinished pages I’ll try to have done before January 9th. I have an enormous amount on my plate, so I’ll just do the best I can. And lastly, Happy Holidays and Merry Christmas to all of you. As you may recall, I stated I would not spoil speculatively when Dimitri rescued Emily at the same time the ring I speculated spoilatively went missing. Congrats Chris! It’s been an enchanting journey! Looking forward immensely to your new project. Chris, it was an absolute joy (except for when it was a heart-wrenching pain) reading this story. Thank you so much for telling it. It’s been an inspiration. Ohai, Chris, since you’re still doing SF/comedy, if you’re still looking for good SF/comedy novels, I just started Starship Titanic and thought of you. It’s by Monty Python’s Terry Jones, based on the PC game by Douglas Adams. Pretty good so far, a lot more bonking than Douglas Adams put in his own novels, but hey. What a journey, and it was one I am both thrilled and deeply saddened by to reach the end of. Still, I have the whole series in book form now. That should keep me happy. Thank you Chris for sharing this epic tale with the world. Nice finish, and here’s to the next project! And Merry Christmas to your sweetie and the kitty clan! … oh, and to you, too. Assuming the kitties don’t use it all up first. And here I was sure the darkhuenium planet was a con. Thank you, Chris. It has been fun tagging along on this journey. Looking forward to the next project! thanks so much for this epic journey…it only got better as it went along. It has been a great story. I’m kinda disappointed we don’t get to see Red9 & Dmitri’s child, though. Can’t wait for the new yarn. But meanwhile I’ll snuggle down by my Christmas tree with my newly arrived Spacetrawler books. That afterstory… was a nice dessert after a good dinner. Thank you for entertaining us! Muchas Gracias, liked the story. I hardly ever post comments on comics, but I’ve been an avid reader of Chris Baldwin’s comics for many years now. 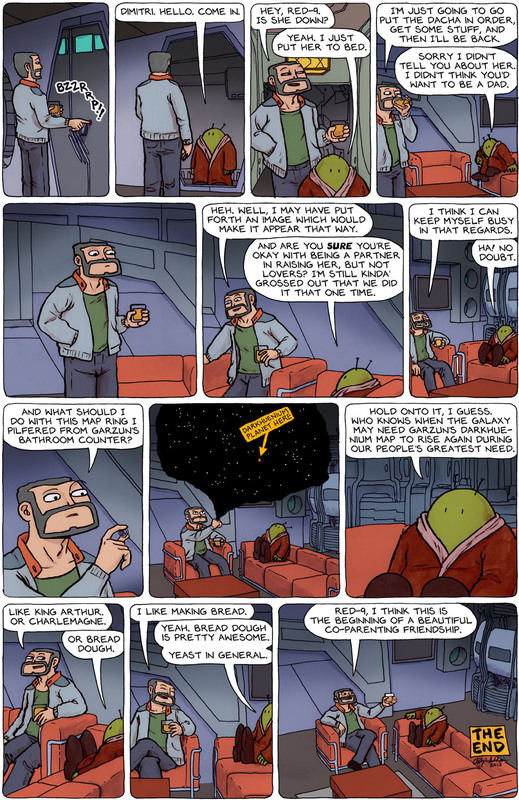 I just wanted to say that Spacetrawler has been one of THE most entertaining, thought-provoking, funny, and emotional stories I’ve read online. Thank you for your hard work, and for sharing your visions. I’m looking forward to your future works. May they be many! Wait… one… minute…… “WHAAAAA!! !” Ok. I’m good now. Just had to get that out of my system. I wanted to see the human-eeb hybrid. All great stuff, many thanks. Looking forward to your next project. And yeah, I’d love to see Dimitri’s daughter. Happy (good grief) 2014! SPOILER: Eeb-Human-hybrids look like Dustin. Well that was a satisfying conclusion. Although I really thought he was the killer, too. Thanks Chris. Truly a great story. Had a wonderful time peering over your shoulder at your drawing table. Magnificent work and a supreme artistic drive to get the job done day after day, both of which I admire. Maybe someday with a little elbow grease, I can do it too. Looking forward to the new series! Vini Vidi Vici Space. A slogan for the saga. 3) I’m seriously going to miss this comic. Definitely one of the best ever. Hard to believe it’s finished, it’s been an amazing story! I agree with Jordan that seeing “Dmitri-9” would have been nice, but maybe someone with more artistic talent than myself could do a fan art of her? Looking forward to your next storytelling endeavor. Happy New Year! Thank you, thank you, thank you. This was one of the finest stories I have ever read. The action, the humor, the drama, the suspense…the humor (did I already say that? Well, it bears repeating)…all top notch. Well done, Chris. I look forward to your next project. Just caught up. Internet access was tight last month. Is there an image of Dmitri and Red-9’s baby anywhere? Here’s the image of the Human-Eeb hybrid! Great story, but… ahhhh! I thought we’d see the web-human baby!